I love a recipe with a story. Even better, I love a good recipe with a good story. Thankfully, living in a family as food-obsessed as mine, we’ve got a few, and what better way to spice up a blustery day than with a good BBQ recipe? Back in 1981, my father had just graduated from theology school and taken a post in Jackson, Mississippi. For a little while, my parents decided to drive three hours southwest of Jackson to Jonesville, Louisiana, to fill the spot of a pastor while the church worked on finding a permanent minister. Jonesville is in the middle of nowhere, and as my mother puts it, and everyone was either emaciated because they don’t eat or grossly overweight–“Life is fried down there and fried well.” One of the women who befriended my young, twenty-something, extremely pregnant mother, was Mrs. Wurster, who shared this recipe with my mother. She boasted that the sauce went well on everything from wild game to hot dogs, and she always had a double recipe in her fridge. Mrs. Wurster also gave my mother a check for $100 to use for the baby (my brother). At the time, my parents had no money to buy a crib, bottles, diapers, or clothes for their coming son, and somehow, probably like Jesus with the loaves and fishes, my mother stretched the money out enough to get the basics. So not only did this amazing BBQ sauce recipe come out of the middle of nowhere Louisiana, but also the things my brother needed to make it–seriously, can you imagine a baby without a crib of clothes? Not a good thing. So, Mrs. Wurster, thank you for your amazing recipe. I have changed it a bit, but not too much, and you know what, if I had enough mouths to feed other than my own, I’d definitely keep a double recipe in my fridge at all times. And I’m sure you never thought of it and you might find it strange and otherworldly, but the sauce goes great on baked tofu and on mashed sweet potatoes. I’ve even been known to dip vegan pigs-in-a-blanket in it. Thanks for keeping my brother clothed and my mother fed, and now it looks like I owe you for the tangy, tomatoey, smoky goodness. In a food processor or blender, blend together the vinegar, water, onion, and diced tomatoes. Pour the tomato mixture in a saucepot on the stove at medium heat. Add the mustard, salt, pepper, margarine, and sugar. Stir to combine. Bring to a boil, then lower to a simmer and simmer for 20 minutes. Stir occasionally. Add the bourbon, Worcestershire sauce and liquid smoke and simmer an additional 20-40 minutes, until the sauce has thickened as desired. oh, i can not wait to try this! mrs. wurster sounds like a very special woman. several times in my life, when i needed it the most and wondered just how i could possibly make it, someone like mrs. wurster came along. angels in disguise, perhaps. thank you for sharing the story and the recipe. that was so nice, generous, and awesome of mrs. wurster. wow! i can imagine how happy your parents must have been to have so much money to buy much needed baby goods. what a great story, Jes – and the bbq sauce looks suuuuper delicious (bourbon in bbq sauce = the best!)! i looooove me a homemade bbq sauce so i’m fo ‘sho gonna make your jonesville bbq sauce. think i’ll follow your advice and smother some ‘fu & taters (and maybe even a bean burger) with lots of it. yay! That’s a great story – thanks for sharing! The BBQ sauce looks amazing, too, so I’ll make it in honor of Mrs. Wurster. I love EVERYTHING included in this recipe, it has all my favorite flavors! And the story is great too, I bet it makes the sauce taste even better. What a heart-warming story to go with this food-warming recipe, Jes. Thanks for sharing. Aw, that -is- a good story! I can just picture the setting now. Food really does taste better when it has some history and emotion behind it. That is a wonderful story. Thank God for good-hearted souls like Mrs. Wurster and thank God for her lip-smackin’lick-your-fingers good BBQ sauce. Thank you for visiting my blog. I really love yours—your writing, your recipes, and most of all your food photography. Every single picture looks professional and so delicious. Looking at your photographs almost always sends me to the kitchen straightaway to find something to eat. By the way, I loved reading about your Mom’s tradition of celebrating the first day of the month. That’s lovely—what a lucky girl you were. Yay for twinkle toe socks! Aw, that story has me all misty! Thanks for the wonderful recipe that beings back so many memories! I’m originally from a small town in Mississippi about 40 miles from Jonesville, LA. 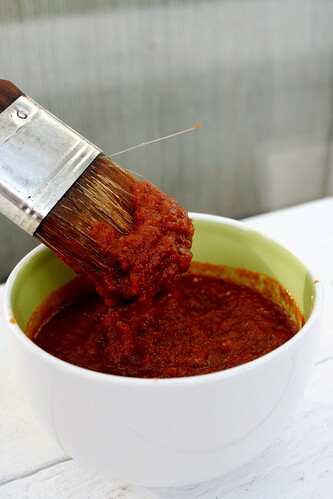 I remember many a BBQ with sauce just like this. I’m making this today for my Tampa Bay friends…..I konow it will WOW them!